Examples of water damage to iPhone abound in daily life. You might have dropped an iPhone in the water while mopping the floor, like Elsa; or drop it into a pool or fountain while playing. Either of these situations should naturally make you panic. Of course, what you're most worried about is the important data inside the iPhone, such as photos, contacts, etc. In this case, you can follow in our footsteps to find out how to get pictures off water damaged iPhone 6. It is applicable to other data types and iPhone models as well. In order to get your lost photos off the water damaged iPhone 6 securely, what you actually need is a professional iPhone data recovery program. Among diverse choices in current market, Joyoshare iPhone Data Recovery is absolutely an outstanding one. It can salvage various possible data loss scenarios, such as water damaged, virus attack, accidental deletion, screen broken, device stolen, passcode forgotten, system crash, update failure, etc. Better yet, it is compatible with a series of iOS models and versions, including the newest iPhone XR/XS/Max and iOS 12. In addition to photos, Joyoshare iPhone Data Recovery even has ability to retrieve more data, like iMessages, calendars, videos, contacts, call history, notes, reminders, voicemails, etc. You might even be able to save your photos directly from the water damaged iPhone 6 if you can connect it to computer for successful detection and recognition. Just take this solution to retrieve photos without using backups. Download and install this program on your computer and go to plug your water damaged iPhone 6 under its "Recover from iDevice" mode. 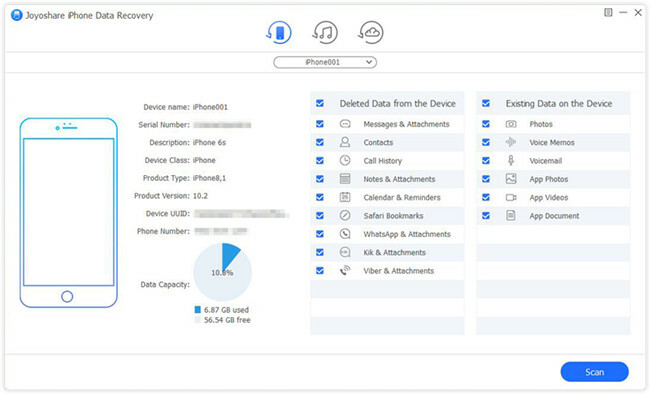 After the device detection and recognition, Joyoshare iPhone Data Recovery will instantly show you related iPhone 6 info and supported data types. You can directly click on the "Scan" button to search all data or only choose desired "Photos" for later scan. Having scanned data from iPhone 6 device, Joyoshare program will display all photos and selected data in your sight. You can either recover all of them by ticking the "Select all" option or restore needed items by previewing and marking designated files. Then simply press on the "Recover" button to start retrieval. The bad news is that your water damaged iPhone 6 may no longer be recognized by a computer. If so, you can try to fetch lost photos from an iTunes backup. Thus, be clear about whether you have synchronized and backed up iPhone 6 data to iTunes; then follow the steps here. Get Joyoshare iPhone Data Recovery started on your desktop screen. Next you can go to the top navigation bar in its main interface to switch recovery mode as "Recover from iTunes". Choose one iTunes backup you would like to recover from the list. Afterward, click its gear "Setting" icon to select data type, like "Photos", "App Photos", etc. Then hit the "Scan" option at the right bottom to continue. Go for different categories to preview all scanned data in your own way. You can have a quick search with the search box or filter out undesired data by clicking "Only show the deleted". Pick up important water damaged iPhone 6 photos and click the "Recover" button to export them. Additionally, you are enabled to recover photos and more data from your iPhone 6 iCloud backups if you have turned on "iCloud Backup" settings before. Here's how this program performs to do this job. Launch Joyoshare and log in your iCloud account with Apple ID and passcode under "Recover from iCloud" mode. Besides, you have to enter the random code if you have already turned on two-factor authentication. Note: You can decrypt and retrieve data from any iCloud backups with different iOS versions as long as you don't enable two-factor authentication. However, if you have turned it on and your iOS version is higher than 11.1, you cannot download and extract iCloud data. There is an iCloud backup list shown for you to choose. All backups are detected from your computer's local folder. You ought to download the most relevant one. Confirm data type similarly and tap on the "Scan" button to search data. When this iCloud backup extractor completes scanning data, you are allowed to check them in the left column. Look through items on "Photos" category, select specific pictures and click the "Recover" button to save them on computer.